For me, one of the best/worst parts of being 6 semesters into my master’s degree studies is that I’m developing a vocabulary and working (but not photographic) memory of the content I’ve studied. In other words, I can speak at length at length about how research has established a link between early childhood psychological trauma and decreased immune function in adults, but the name of the author or of the research studies isn’t committed to memory. Having the data but not the “citation” in working memory means that if I need to cite the data for an academic paper, I might spend hours reviewing literature I’ve read or annotated during grad school. As I’m moving towards graduation, this has increasingly become an issue- and for awhile I found myself spending way, way too long with the indexes of old text books. Then one day, looking up a table of contents for a book I didn’t have on hand at my desk, I realized Google Books can make the task of locating specific content much faster. 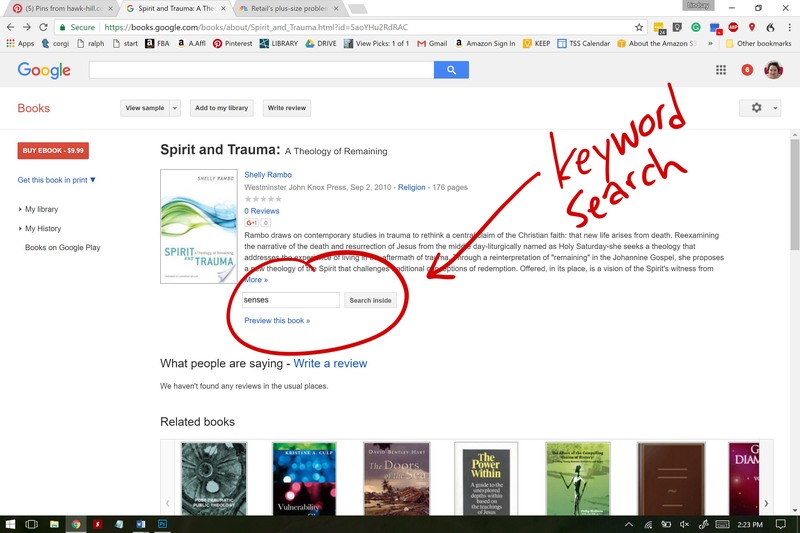 Use Google’s “Search Inside” to find quotes from a book that use specific words. This delightful little search box hidden in most (but not all) Google Book pages enables the user to search for the occurrence of specific words within the text of a book. Essentially, it takes print-form books and allows you to search within the text as if they were eBooks. In the example picture, I knew theologian Shelly Rambo wrote extensively about the integration of physical sensation as a part of recovery from trauma. Instead of flipping endlessly through her book, which I had on my desk, (and which, frustratingly, lacks an index) I found the Google Book listing, searched for “senses” in the text, and was able to scroll quickly through all occurrences of the word in the book- with no page flipping. I like this method of searching for quotes because Google books paginates in the same format as the print copy of a book. (For every book I have checked, the print version of the text has been accurate to the page number). 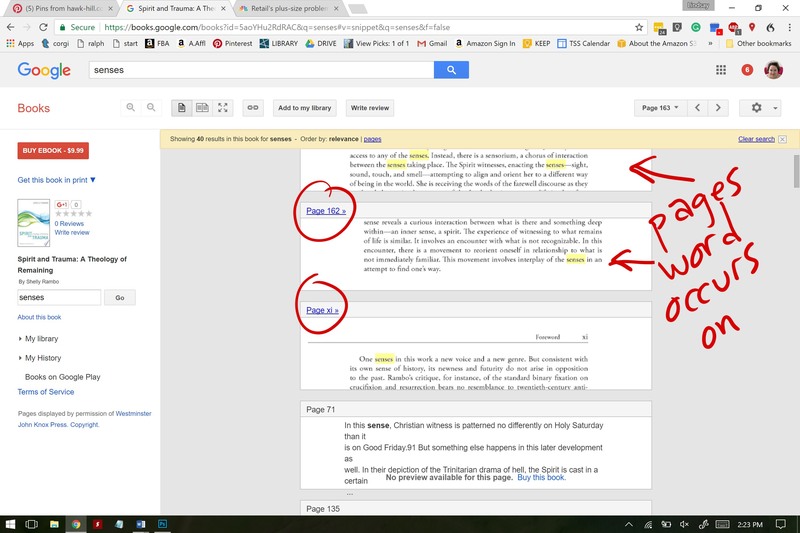 Often even when I have the book on my desk I use google books as an easy, electronic index. For example, the printed index included at the end of a popular Developmental Psychology book “The Developing Mind” has 0 entries for sexuality, but a search of the text on google books can direct me to 10 uses of the word and a snippet of the context they came from. Google Books saves the day when I’m trying to finish a paper late night and am scrambling to find just one more source to meet paper requirements, or needing to cite a source for a quote I vaguely remember. It’s then when I pull up multiple books I’ve read on a topic and use google books to search the pages for a relevant quote. Knowing the page numbers line up with the print copy makes it easy to cite correctly without needing to get my hands on a physical copy of the book.